When it comes to weight-loss solutions, if it sounds too good to be true, it probably is. But there are exceptions. One of them comes from a new study by researchers at the University of Oklahoma. It showed that men and women can lose weight without making any conscious effort to eat less simply by exercising and drinking one or two whey protein shakes daily. In fact, the study showed that by combining these two measures—exercise and protein shakes—overweight individuals can improve their body composition and even improve their fitness level significantly more than with exercise alone. The most popular way of losing weight is through calorie restriction. But calorie restriction is rather ineffective in the long-term. More than 50 percent of people who lose weight through calorie restriction eventually regain it. This is because calorie restriction produces nagging hunger, which in turn causes dieters to revert back to their old eating habits. In addition, calorie restriction causes dieters to lose muscle mass, which reduces their metabolism, so that while they are eating fewer calories they are also burning fewer calories. Thus, cutting calories alone to lose weight neither “sounds good” nor is it a “true” path to long-term success. Past research has shown that exercise promotes weight loss even without calorie restriction and is much more likely to result in permanent weight loss. Previous studies have also shown that increasing protein consumption improves body composition without caloric restriction by reducing appetite. The purpose of this new study from the University of Oklahoma was to investigate the effects of combining these measures on body composition and fitness. Thirty-eight overweight, sedentary subjects participated in the study. Eighteen of them engaged in a 10-week aerobic and resistance exercise program. Nine of these eighteen also consumed a high-protein shake once a day for the first two weeks of the study period and twice a day for the last eight weeks. The remaining 10 subjects did not exercise or consume shakes. The increase in protein intake resulting from the consumption of the shakes appeared to reduce the appetite of the subjects receiving them, as their average daily caloric intake decreased by 14.4 percent compared to the other two groups during the study period. Fat mass decreased by 4.6 percent in the exercise-only group and by 9.3 percent in the exercise-plus-shakes group. Members of the exercise-plus-shakes group also increased their muscle mass. The researchers who conducted this study looked at changes in fitness as well as changes in body composition. They had all of the subjects perform a graded exercise test on a treadmill (meaning they ran at ever-increasing speeds until exhausted) before the study period began and again at the end of the study period. 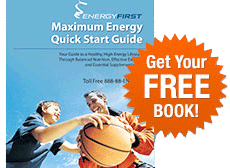 Time to exhaustion in this test increased by 9.8 percent in the exercise-only group and by 21.2 percent in the exercise-plus-shakes group. How did the protein shakes enhance the fitness-boosting effect of exercise? This effect was probably mediated through greater fat loss and muscle gain. The supplement used in this study, which was published in the journal Nutrition & Metabolism, contained 40 grams of protein as well as 25 grams of carbohydrate and 5 grams of fat per serving. As effective as this supplement was, a shake containing a more favorable ratio of protein to carbs and fat would have worked even better. 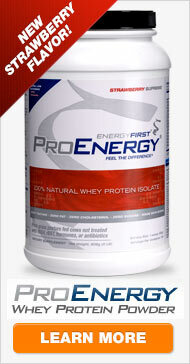 EnergyFirst ProEnergy shakes contain 19 grams of protein and only 3 grams of carbs and 0 grams of fat per serving. Would you like to lose weight without consciously eating less? Then work out and drink EnergyFirst ProEnergy shakes!